Book holiday - we pay! Long walks on the beach, romantic sunsets, or simply let your mind wander? Give your users with the travel voucher lottery directly into the dream holiday! 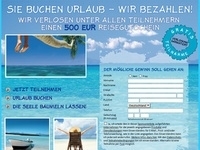 Lots Namely, a travel voucher worth 500 euros! The winner / the winner decides where it goes! For valid (DOI) registrations you get a lead fee of 1.00 euros. Caution: They started with an empty database! 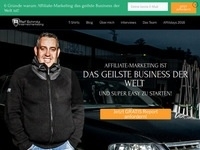 Increase your sales immediately and apply actively campaigns condatix GmbH! You have then the network a large number of graphic banners, text banners, text links, and a stand-alone template. For questions about the campaigns of condatix GmbH please contact Alexander Loos under al@kuehne-loos.de.